Henrycuis Calton married a Miss Stubbinge in Dec 1593 (North Wingfield?). They had at least one son, Johnis Calton (no db) who on the 25/5/1693 had his son Henrius christened at Wirksworth. 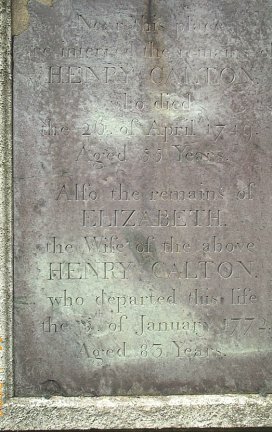 This is (hopefully) the "Henry" of the plaque who married Elizabeth Coates at Wirksworth on 13/7/1723! If you or any of your colleagues do find any references to "Campion" in or around the Derby, Ashbourne, or Stafford/shire areas between 1750 and 1820 I would be gratefull for the info. I know you have a Charles Campion at Frog End in Wirksworth who shows up in the 1881 census - but I am trying to find a link between a suspected ancestor, a Robert Campion who lived in Derby around 1745-50 and my Great-great Grandad Charles Campion who was born around 1810 in Neighton, Derbys according to the 1881 census. "Neighton" does not apparently exist and I wonder if it is a C19 corruption of Kniveton or Beighton (near Alport). The reason this is important as there have always been family legends (don't we all have them???!!!) about my family's involvement in Derbys with the '45 Rebellion.